April: not a joke. This is real snow. Remember how I said last month that the snow was receding? Well, it must’ve overheard my hubris and felt the need to prove me wrong. April was, uh, pretty snowy. Although our winters are indeed long up here in Vermont, this winter took it to the extreme and overstayed its welcome. The snow would melt, tempting us with a glimpse of bare earth, only to jealously cover the nascent grass with a colorless slate. Back and forth we went all April long, with snow exacting its final revenge with one last (admittedly lovely) snowfall on April 30th. Seriously, snow? You just couldn’t let April go. All this tardy snow gave us the excuse opportunity to catch up on indoor chores. 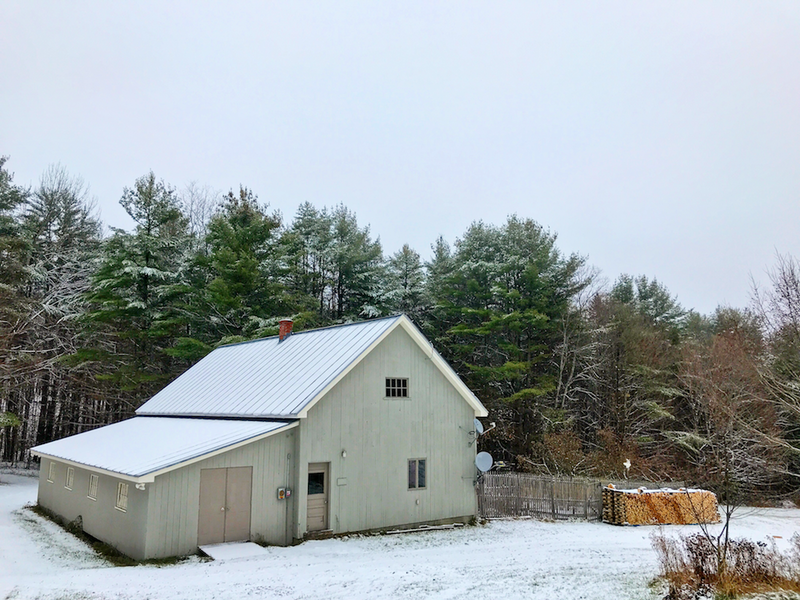 We knew the earth stood poised under the snow, ready for us to till and prepare and plant, but all we could do was plan and plot from the snowless warmth of our woodstove-heated home. Mr. Frugalwoods seized on this late winter to organize and clean out the barn and lean-to (the lean-to being a little building attached to the side of the barn used for tool and equipment storage). Since moving here two years ago, the barn–which was built by a previous owner as a woodshop, not an animal barn–has served as the catchall for tools, lumber, equipment, dead bugs, and outside gear. It was a hot mess, to put it mildly. Mr. FW’s had his eye on bringing some semblance of order to the situation for months now (I like to think he was inspired by my whole house decluttering project, but I think it might be more that he likes to tinker around out there alone). 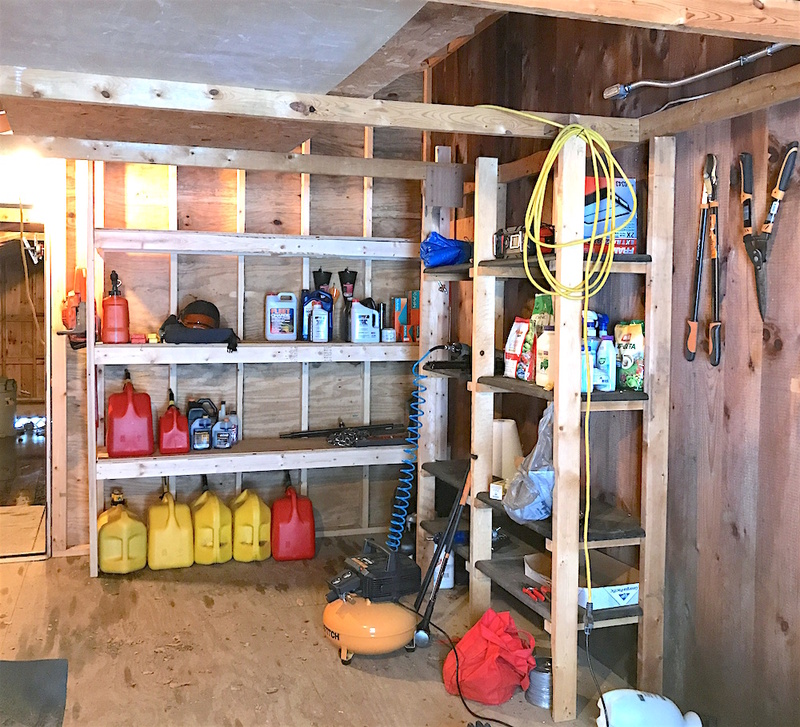 Thanks to his newfound ability to haul lumber and tools (hat tip to our new-to-us truck), Mr. FW built shelving units to hold all of the various oils and gases required by the tractor, mower, trimmer, and chainsaw. He configured clever little storage racks and hooks for rakes and axes. He even built a custom chainsaw pocket on the side of one of the shelves to slot the saw into. In his new tool chest, he arranged all of his wrenches and nuts and bolts and tools of all kindses. He sifted through unpacked moving boxes and flattened the cardboard to be used in our vegetable gardens to hold mulch. He built sawhorses in order to allow him to build more things. He reconfigured his gardening supplies. From a miscellaneous stack of stuff, he created order and empty space. It’s not quite a done deal yet, but it’s looking pretty darn good in there. Babywoods likes to go in the barn and “take a walk” in order to view all of the tools and whisper their names under her breath in a reverent tone that imbues the words “miter saw” with far more gravity than they deserve. She then turns abruptly to a parent and reports, “I will learn to use it when I’m older.” Sure thing, Babywoods. All of this organizing–along with the advent of our truck–sent Mr. FW into a woodworking frenzy. He bought a used SawStop table saw, he bought lumber, he bought other woody stuff and then, he got to work. In addition to his organizational shelves and hooks and sawhorses, he built what is now known as the Toddler Tower Of Power. I’ve had my eye on these learning towers for awhile now, but at $200 new (and not much less used), I haven’t been able to bring myself to buy one. Babywoods is keen to “help” us in the kitchen and will industriously drag a chair up to the counter or sink in order to get in on the cooking or dishwashing action. The chair thing was kind of working, but one of us had to stand behind her so she wouldn’t tip out of the chair, which made cooking difficult. At any rate, I was talking about this tower idea and Mr. FW offered to build one. Perfect! 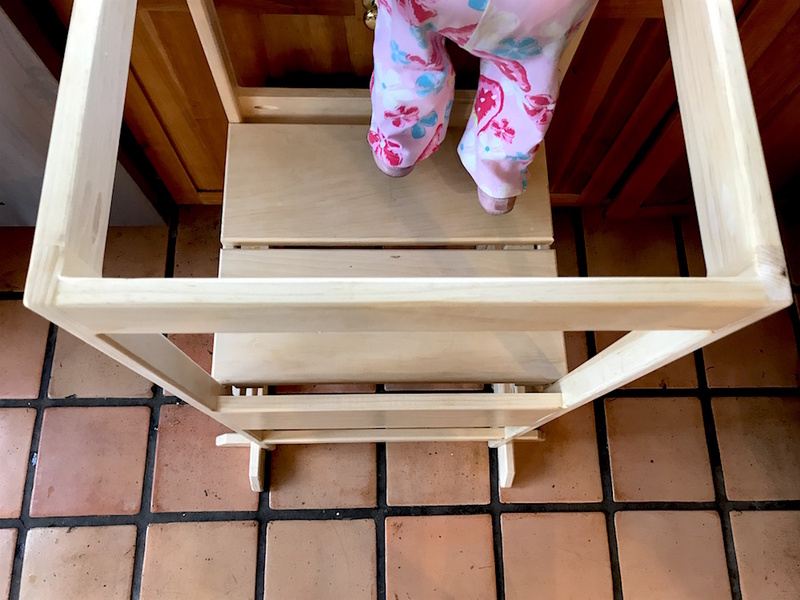 He got to test out his new tools, refresh his skills, and make Babywoods a totally awesome way to reach everything in the kitchen (what on earth were we THINKING?! J/k she loves it). She is a big fan of standing in it at the kitchen sink to “wash” dishes (so helpful, again). I love that she can now safely stand at counter height and partake in all things kitchen. Mr. FW plans to teach her how to cook before too long here, so this seems like a great introduction to the process. She’s pretty good at putting sandwiches together and can even sort of, kind of help me measure out the ingredients for our homemade bread (what’s a little extra yeast between friends?). Now that I’ve seen Mr. FW’s woodworking skillz in action, I’ve commissioned an entire wishlist of items for him to make. Well, actually only two things right now: a trash and recycling center for our kitchen (we are forever overfilling our recycling bin and I want two larger bins so we can sort out our two types of recycling right there in the comfort of our own kitchen) and a bench next to the creek behind our house where Babywoods loves to play (and I do not love sitting on a log to nurse Littlewoods). A girl can dream. 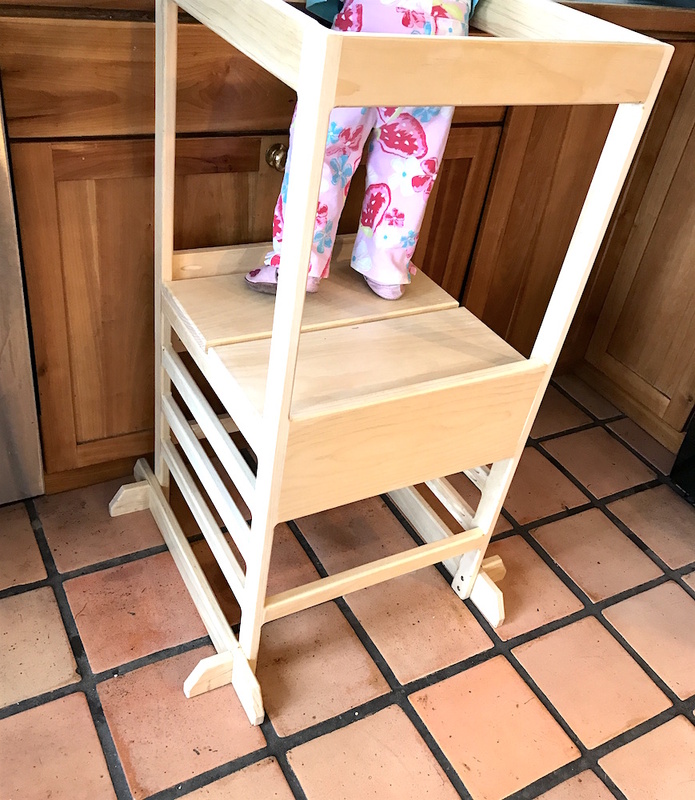 Should you so desire to build your very own Toddler Tower Of Power, Mr. FW used this plan with just a few modifications. April was also the month of spring swaps for the tractor and house. Mr. FW took the snowblower attachment off the back of the tractor and put the tiller attachment on–ready to roll for spring planting! It’s a laborious process to get these attachments on and off, so he tries to do it just once per season. Next up, he took the storm windows off the exterior of our doors and windows and put on the screens for summer! We don’t have air conditioning, so we need those screens to let cool breezes blow through the house. It doesn’t get terribly hot here in the summer, so we’re usually fine with this natural cooling. And then we’re super hot for about a week in August and curse our absence of air conditioning. Then it’s fall the next week and we put our sweaters back on and forget all about that ephemeral season known as summer. I shared the details of our vegetable seed starting project last month and this month, the starts just kept right on growing. We’ll likely put them in the garden in late May–assuming we’re frost-free at that point. As I’ve written before, growing your own food is no joke. It’s not easy or even particularly cheap and it’s time consuming. It’s worth it to us, but it’s an eye opening view of how challenging it is to make food. Our veggie gardens also serve as a reminder to us of how fortunate we are that we don’t need to earn an income from our land. We are profoundly lucky that we’re able to choose this lifestyle, but that we’re not reliant on it for our livelihood. We’re continually awed by our farmer neighbors and the tremendous work they do in order to raise food and farm for a living. An unwanted critter took up residence inside our Prius this month, which we knew because it kept shredding tissues from my center console tissue box (I never leave home with snacks or tissues! Or my children–I swear I don’t forget them). Not cool. So, we set a few traps, which seemed to eradicate the, ahem, problem and provide a few mouse snacks for our neighborhood owl population. However. After a few successful trappings, we realized that more mice were somehow getting into the car. This was not an isolated, solitary mouse event. It was more like a revolving door of mouse families coming to hang out in our car. Gross, you guys. Unsure of what our next offensive move should be, Mr. FW took to the internets and figured out that mouse infiltration is, like, a THING in Priuses. Great. Luckily, the internet recommended a fairly easy fix: replace the cabin air filter. No problem. Mr. FW bought a new filter, dutifully followed the internet’s instructions on how to replace it, and even went the extra step of putting dryer sheets in the glove compartment as these are apparently a mouse deterrent. Things were good. No, things were great! When you go from having a rodent circus inside your car to not having a rodent circus inside your car, you are super jazzed with life. We thought we had it made in the shade. TO BE CONTINUED NEXT MONTH (because hopefully we figure out a new solution by then. If not, just forget I ever mentioned it and secretly judge me for harboring mice in my vehicle… ). Onward to May, frugal comrades! How was April on your own personal homestead? Haha, Prius mice. Well, look at it this way. At least they’re not chewing your wires or cables in the engine block. That happened to me once, no fun! In the Mineral King area of Sequoia National Park, the marmots like to gnaw on radiator hoses. Yes, the wire chewing is apparently common in the Toyota brand family. It happened on our 4-runner, not once, but three times! We paid twice to have it rewired so our car would pass inspection. Our auto-shop said that it was hard to prevent, and we’d probably have to move to get it to stop lol. We did actually move and it hasn’t happened again. My husband now drives around without power steering (I think) because we haven’t wanted to rewire that a third time. When I bought my car, the dealer tried to sell me an extra warranty for those wires, and the salesman cited a squirrel who had eaten his car wires in the work parking lot of all places. He had to pay out of pocket for the fix since insurance wouldn’t cover it, but the warranty he was peddling would have… Guess who did NOT buy an extended squirrel protection 😉 I park on the interior of the work parking lot just in case! We had a mouse climb up into the engine (a Toyota as well) and die one summer and the stench was awful. Did I mention it was TN with 90-degree heat? Ugh, what is wrong with these mice?! Tower Of Power?! Hahaha that’s the most amazing name. You can tell Babywoods is a clever, clever child already. We have a 2500 sq “homestead” and the most productive thing we have grown is garlic. I don’t even care about the garlic, I want the delicious, delicious garlic stems!!! They’re so underrated. We use car fresheners or peppermint essential oils on a dryer sheet in the glove box to keep mice at bay in cars. The peppermint oil even kept them out of our chicken coop this winter. OMG yes, I love eating the garlic leaves! Yeah, you don’t get as big of garlic if you are cutting off the leaves and adding them to your frying pan, but they taste so good! Time to introduce a pair of frugal felines. Newer vehicles are more environmentally friendly with parts made from things like soy derived plastic, hence things attracting and being smacked on by rodents. The route in is marked with scent by previous rodents. Pine Sol, bleach, etc in a sprayer 6-8 feet out and on surfaces in your garage will eliminate the current path. I am sure you have done major disinfecting of the car so your family is less likely to deal with Junta virus, etc. I didn’t know about ‘routes’, but when we had rats in the garage we cleaned everything in that area with bleach then sprayed it down with a combination of bleach and febreeze and they found somewhere else to live. I second the cats. Every barn needs a cat, just to keep the mice under control. Also a member of the mouse-in-my-Toyota club, to the tune of $745 wires/tubes repairs. We used to keep our car outdoors in Massachusetts during the summer, but now it is garaged which has helped. If you use the car daily, they don’t seem to like that. We are just moving to a mini homestead here in Appalachia that will have a garden tractor (with attachments) and several tools. I’d be interested in hearing more from Mr. Frugalwoods on his organizational project. I’m going to have to do something like that at some point. Thanks for sharing your continuing adventures! Aww Babywoods is too cute! Our 3 yo son wants to help out around the house too. Usually, it’s opening/closing/locking the door and carrying groceries from the car into the house. I just think it’s adorable. But it can also get annoying sometimes hehe. Mr. FW is such a handyman! The Tower of Power looks nice and sturdy. Definitely better than the $200. I didn’t even know these chairs existed (together with the baby tent from your last post). Some people must be really hands-on with their kids and creative to have thought of these products! Mice infiltrate our home in the winter and we just set out traps, keep our food in plastic containers so they don’t get ripped open, but I don’t know how I’d feel about having them in our car… for some reason the closer quarters ups the ick factor. If you can’t persuade the mice to leave your car alone, instead of fearing judgment as ‘a mouse harbourer’ you might like to see yourself as ‘an animal-lover who provides homes to more critters than intended’. Awww, how kind, squeak all the Prius tenants! Haha, I like how you think! The Tower of Power and the rodent circus references cracked me up! I was unaware that there even was such a thing as a cabin air filter (yeah, we drive old vehicles) until about a year ago, when I replaced the one in our ’03 Pontiac Vibe in an attempt to combat musty odors. Very strange that the Prius is so often the target of such infestations! YES! A garage is definitely on our longterm to build list (but it’s behind the woodshed, which is up next 🙂 )! When he builds it, he should consider installing heated floors. We live in interior Alaska, and having a warm garage floor when you need to be under the vehicle or plow or…whatever, is a God send. Especially as you age. We thought it would be very expensive, but it was quite reasonable so keep that in mind. If he’s going to be doing any kind of serious work in there, I highly recommend a vehicle lift. They’re soooo nice and can be had relatively inexpensively. We soak cotton balls in peppermint oil and stash them all over the car. We also put peppermint oil on the cabin air filer — and keep the car garaged with traps in the garage. It’s a constant battle. Sealing the garage door went a long way toward cutting down on the mouse problem — my husband used garage door frame weatherstripping. When the cat’s 🐱 away the mice 🐭 do play!! I vote for a (neutered) kitty or two. I know that Gracie the Wonder Greyhound just went to the Rainbow Bridge a few months ago, so perhaps you’re not yet ready for a new pet. But desperate times call for desperate measures! We’ve parked outside for years and have never had critters in our cars… maybe it’s because we’re in town. You can buy these little mouse repellent pouches which have worked well in the past for us (Target, Amazon). Its worth trying. Right now, we have mice feasting on the bird seed in our garage. Clearly, we need a different storage method! We have those little field mice all over the basement! You guys might need a cat. We would get one but Mr. ThreeYear is allergic. I hear that’s the best long term solution. I remember my first car, a Ford Taurus, got mice, and it was sooo hard to get them out. Good luck!! I was going to suggest a cat from my sister in law’s experience – she borrowed her coworkers cat (OK more like cat sit) and she never had any rodent or raccoon or crazy bird issues. Its like the animals talk to each other or something! Ha! Rats, squirrels, birds, geckos, cockroaches … the cats kept everything away. And the snakes, of course. They die and break your heart. And not every cat will be a hunter. My mother-in-law’s cat never was. My sister-in-law’s cat never was. The other cat of my sister-in-law is not – she’s terrified of mice, in fact. And the emotional price is very high. It’s been said that the soy-based coating on the wires attracts mice in Toyota vehicles, plus they don’t have mesh screening over all the openings. Some people have reported putting mint oil on a cotton ball and placing it inside the glove compartment because it deters mice (and makes your car smell good!). Just cleaning/changing the filter isn’t enough. It is also possible to DIY a mesh screen if you are dedicated. Another tip is to put the venting system into recirculate mode, which closes one opening but not all of them. Good luck with that. A “barn cat” or two might solve your mouse problem, and prevent the mice from getting into your house in the winter, if they haven’t already. Compared to normal house cats, barn cats are incredibly low-maintenance. They get food and water early in the morning or late at night so they can use the rest of the day to catch mice, and might need an occasional vet visit. My parents’ barn cats were never allowed indoors – we gave them some hay bales in the barn to hunker down in and ride out our Northern Illinois winters, and they were just fine. I’m sure that some of your neighbors have barn cats – maybe you could ask them for more information, or arrange a swap if you decide to get one? Just make sure that if you do get a barn cat, it knows how to hunt. The former house cats who are often available in shelters may not know how to hunt, and won’t help you solve your problem. I’ll have to consult my former Toyota mechanic. Mice live in our garage as we have 3 indoor cats but they have not yet moved into our cars. Not that I can park in my garage due to tools, toys, and other cars. I wish I was more naturally organized. I always envy those of you who are born with this quality. I work at it, but my brain is too disorderly to allow for any real order in my life. Agri-D3 is a fairly innocuous (insofar as such things can be) organic-approved mouse poison — its basically Vitamin D in a lethally large concentration. Nice idea to build your own tower! They seem to be the trend lately. We just managed with chairs and step stools without any issues (our kiddos are 6 and 2). If anything, the kids learned really quickly balance and not fall off! In our kitchen, something that size would’ve been way too big to work around 😉 I trip over their little step stool all the time. Nicely done Mr. FW! It’s so nice when you can custom build something yourself! Our family swears by those kid shelves. We got one as a gift, so we didn’t have to spend, but awesome that your husband could build! OMG the mice story is not going to help me convince the wife to move to Vermont one day! She was less than pleased when we found some droppings in our Sugarbush VRBO this winter. I may have to forget I read this story until you have solved this tiny critter problem. Oh don’t worry, mice get in cars all over the country! My family in southern California has had the exact same thing happen to them many times. Do you want to feel better about your mice-in-Prius issue? When i was a kid, I *really* wanted a pet rat. When a kid brought my father, a science teacher, a rat that he had trapped at the garbage dump, my father thought it would be HILARIOUS to give me that as a pet. It lasted about a week in the cage and then when I tried to clean out soiled bedding, because it was a wily wild rodent, it escaped. AND IT WAS PREGNANT. We had a HORRIBLE rat infestation, and they grew as big as cats. We carpooled a lot, and we were taking kids we didn’t know well to some school event, and the girl in the backseat said, “this seatback is moving strangely.” We knew our rustbucket car was going to fall apart any moment, so didn’t think much about it until A RAT CHEWED THROUGH THE SEATBACK AND STUCK ITS HEAD OUT WHILE WE WERE TRAVELING, right beside this girl who was trying very hard to not have a nervous breakdown as a descendent-of-a-garbage-dump-rat was probably going to bite her for being in the way. M: Thank you for a hilarious story to start my day!! Ok, that rat story is way worse than the squirrel in my office which ate my annual review portfolio issue. Wow! Makes me think about George Orwell’s 1984. Toyota and mice are a thing all over. Try putting a DIY mesh screen to keep them out of the interior. Youtube has videos on it. In the engine we put a Rid-A-Rat in and it works great. We had mice not rats but it worked. Gen 2 and gen 3 prii have two ventilation areas that mice love. The cabin air intake and the rear exhaust for the hybrid battery fan. Just cover both with 1/4″ metal mesh. I had a mouse chew on some cable in my car a few years back, and I had to replace the whole harness….cable harnesses are insanely expensive! And the labor was expensive too because naturally the location of the harness practically requires the engine to be dismantled…I hope this doesn’t happen to you!! Oh sister, it’s not just a Prius thing and stay on it because they can cause significant damage. I drive Toyota Corollas and they have made homes in them over the years. But, two winters ago, they chewed some of the wiring for one of my driver’s side airbags and they also chewed a back seatbelt nearly in half. What worked for me this winter was putting mouse deterrent sachets throughout the car–in the compartment, in the trunk and in the glove box. It smells strongly of spearmint–which I don’t care for–but I put up with it to eliminate them from the car and it worked well. 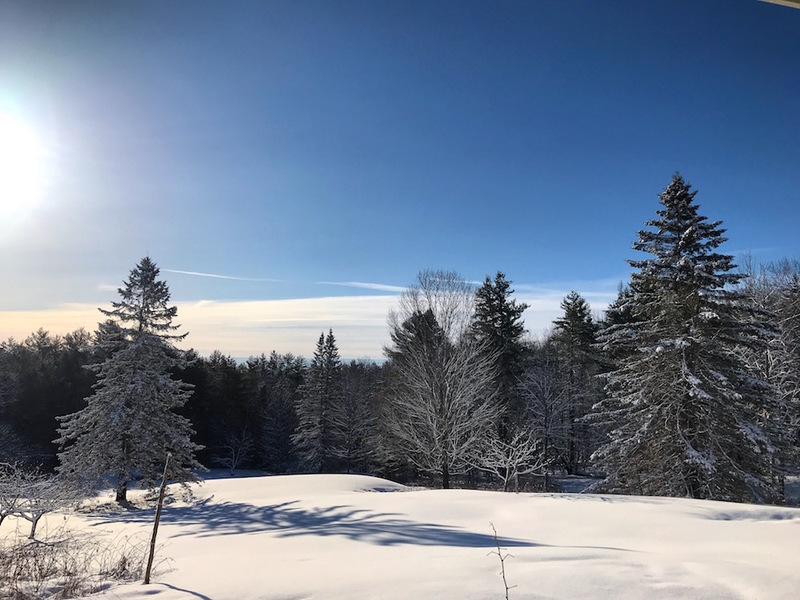 There was no evidence of mice this winter and this was one of the toughest ones for them in Maine–several, several feet of snow and weeks of zero temps. Wow, and I thought it was crazy in Wisconsin when we got hit with a foot and a half, about halfway through April! It mostly annoyed me because I spent all weekend shoveling, then had to go to work, then by the time I could get out and play in it, the temps went back up. Gah! Just a reminder that I need to keep working to achieve FIRE so I can play in the snow when it’s there! EEK! I knew cats liked to snuggle up close to the engine, but never knew mice had the same desire. I hope you find a way to encourage them to find a new home. In any case, once it stays warm outside, you should be okay until fall when they are looking for a cozy indoor home again. Try an ultrasonic rodent devise in the garage! I love all the woodworking projects. It’s great to have a place for every tool, out of the way of curious little ones. Plus, lots of money saved on things like bookshelves! I hadn’t heard about the mouse problem of Prii, so although it’s unfortunate you were invaded, I’m glad to have the info as a Prius owner myself. Wow, somebody who knows Latin: re your Prii comment! We too had a mouse in the car. It was revealed once we had a whole bunch of insulation fall out of the sun roof… and a really horrifying smell when we turned on the air. It is impossible to find a dead mouse in the inner workings of your car. I’m glad you found a way to stop them before it’s too late! One great thing about this is you don’t have to kill them if you don’t want to – just relocate far far away in the forest. A major plus is this is no danger to children or pets! When you talked about Babywoods copying Dad in the barn I had a thought about toys. 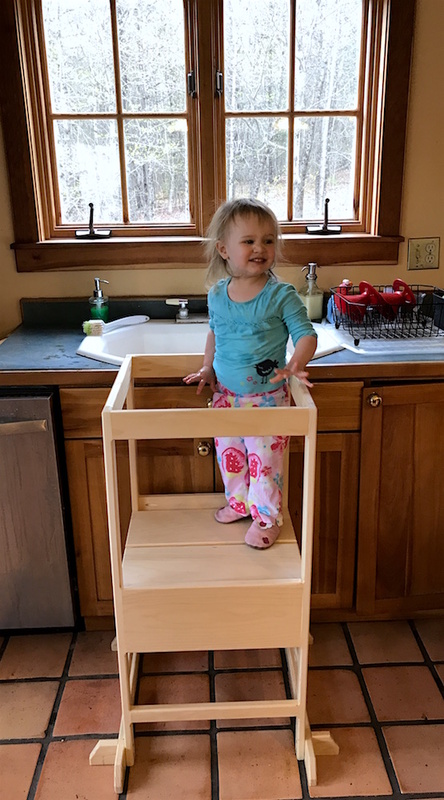 Since all the tools are in specific places you could have her create organizing racks from cardboard along the same lines for all her toys – a great incentive for putting them away (instead of YOU putting them away for her). As a kid I loved making houses and other things from large cardboard boxes with “relatively” safe knives to cut doors and windows and other stuff. Also markers to draw designs on them like rocket control panels and the like. I’ll bet she would love making cardboard storage racks for toys! Fortunately, Babywoods cleans up her own toys now :)! A great aspect of her love of helping with chores! One winter day many years ago, I entered my office to discover a squirrel running amok. Apparently, it had been coming in for days (while I was not in the office, of course) building a nest with the box of Kleenex and some random flyers. I was flabbergasted and didn’t know what to do. A colleague of mine saw the situation and exclaimed, “Oh, I love squirrels!” To which I said, “But it’s in my OFFICE!” Luckily she agreed that it was not the appropriate place for the cute little creature, and she shooed it away through the open window (which I promptly closed). Upon careful inspection, it turned out that the squirrel had eaten 1/2 inch along the binding of my annual review portfolio, and the joke the rest of the semester in my department was that a squirrel ate my homework. Ha ha. Best of luck with the mice in the Prius situation. Please give updates! I love the toddler tower! What a great idea. Here in MI, we’re just setting out warm-season plants in the garden and harvesting rhubarb and asparagus. I’m going to send this post along to my husband. I have been wanting one of those towers for our toddler but haven’t bought one yet because of the price tag for a short-lived item. But our daughter already loves “helping” me bake and I know she would absolutely love her own tower of power. My husband is woodworky too so we’ll see about this project! I love the organization in the shed. 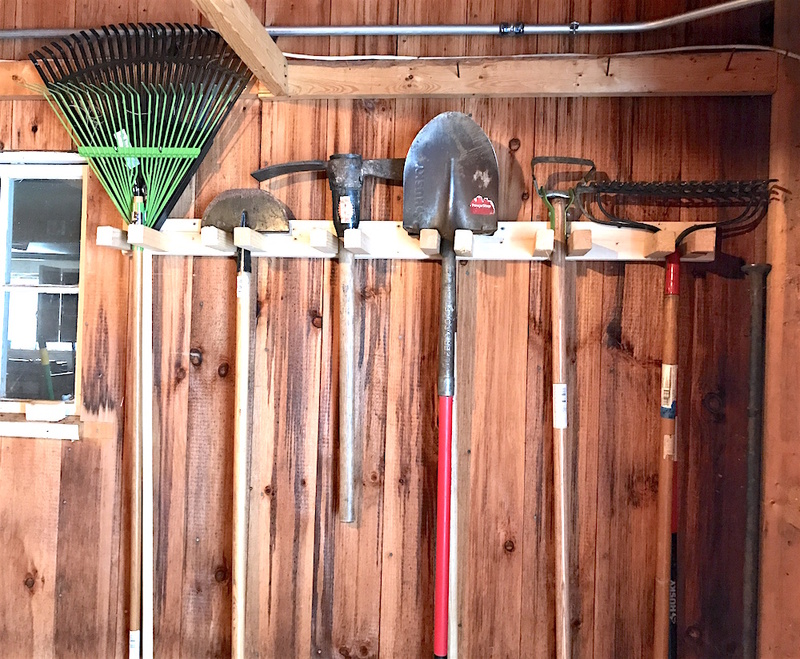 When we got a new shed for all of my husband’s tools, my kids and I spent an entire weekend putting the tools in it and organizing every little inch of it. It was perfect. Today, you can’t find anything. He never returns anything to its proper spot. Oh, for a husband who is organized! Snow at the end of April sounds incredible. I’m pretty sure I would be really tired of snow by then. We’ve had the opposite problem here — we just had above-normal highs of mid-nineties, which is hard on our little garden plants. Luckily it’s cooled off at night just enough to keep the tomatoes blooming and setting fruit. Once it stays too hot through the nights, they quit producing. Not a problem one has in Vermont, I would surmise. Our mechanic told us that the outside air vent for circulating air is a “mouse highway”. We quickly developed the habit of closing that highway when we pulled into the garage. It worked! Have you considered the all natural remedy for mice control? Get a cat. Don’t feed it canned cat food. My dad always said if you feed the cat canned cat food, they get fat and lazy. So I always fed my cat (sometimes cats) dry cat food. Let FC (FrugalCat) show how useful (and loving) they can be. Never had a problem with mice, but was presented with loving tokens of beheaded mice at the door step, just so I would know she worked and won. Well, at least she didn’t bring it in the house, lol. Ummmm…. remind me not to get a Toyota. Not sure how well I would cope with mice in my car. Ooo that’s too bad about the mice-in-Prius problem. Very glad I read this, though, as my boyfriend recently bought us a Prius for our work commute and I’ve had mice-in-my-Honda CRV problems in the past. Good to see all the tricks for preventing the mouse issue. We’ll have to try the peppermint trick. I love pet mice and rats, but wild ones totally freak me out. Nice looking toddler stool there! I love to build stuff also, and in my mind this is one of the best benefits of being financially independent! Instead of having to pay for everything I can generally *build* whatever I want for considerably less than it would cost to buy. Having the time to scrounge materials for free and the time to build things is a huge advantage! My Prius was home to a rat’s nest several winters ago. I was told it’s a common problem for Toyotas in more rural areas as mice seek a warm and dry place to den in the winter. My problem was I left dog treats in the car and was parking next to a dumpster (in an urban area) as that was my assigned apartment parking spot. One very expensive cabin air filter fix later, I requested a new parking spot and never leave food in the car. Haven’t had more mice. All the internet recommended options – mint, dryer sheets, etc. didn’t really help – only removing food and moving the car’s parking spot helped me. The chewed up wiring is really expensive and unpredictable. My mechanic told me to see what issues come up and then bring it in for repairs as just inspecting all wiring is prohibitively expensive. It took me a while to realize that the wiring for the AC (evac temp sensor) had been chewed through and the AC wasn’t working. It was spendy to fix ($$$) but much less than the $,$$$’s I’ve heard others have spent. I had to take it into the dealership for the fix as wiring was above the local mechanic’s ability. I just love reading these updates on your life on the homestead. It seems like such a wonderful adventure! I sometimes think I would love that kind of life, but at the end of the day I’m not really a fan of manual labor. So maybe that’s not for me! Lol! Either way, I love hearing about everything you guys get in to! Hi there, a little random comment for you: I just requested your book at our local library, and I’m number 18 on the list! You may be interested to know however, that my local Library is Launceston, Tasmania, Australia…You gotta love the reach of the internet huh? How fun! Thank you for sharing that (and for reading my book) :)! We invested in our fruiting plants when we moved here. We waited three years, nurturing things along. This spring we had peaches, plums, currants, blueberries, strawberries, gooseberries, and grapes all growing beautifully. We were so excited. I could almost taste the gooseberry pie. Then the hailstorm came. The strawberries were tucked under their grass clippings mulch and came through fine. Not so much the other things. I don’t think eight gooseberries will make a pie. But we have hopes for next year. You really do get a respect for food producers when you grow your own. I’d love to see a post about your recycling center.